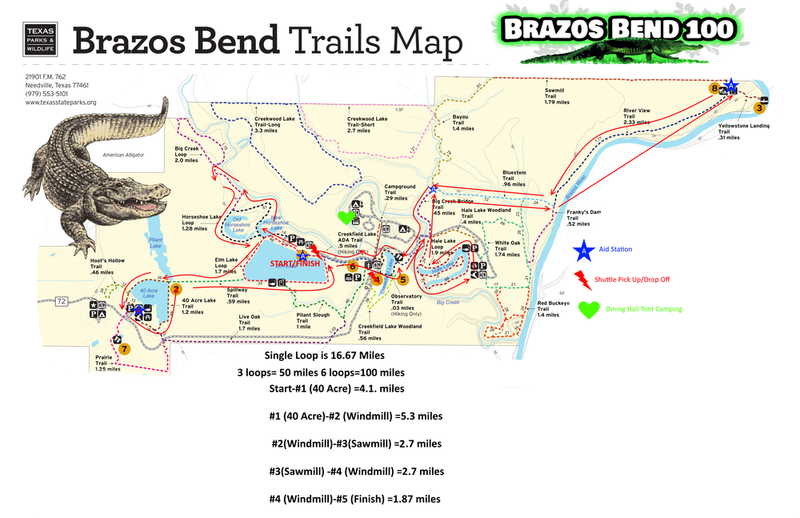 The Brazos Bend course is the fastest trail in Texas trail running. The course is 99.9% flat, and the only hill is 10 feet. 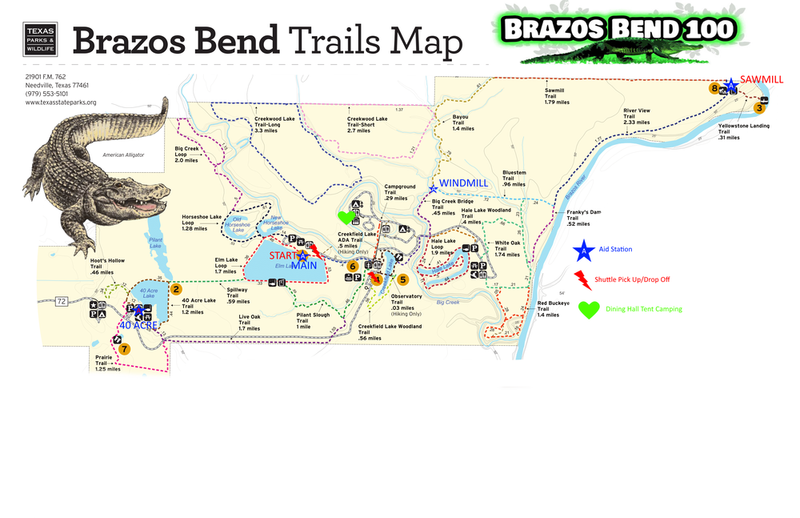 Other than that you will be running on flat surfaces that move from hard crushed rock, soft trail under canopy, and easy horse trails. The 50 mile will top out at 300 feet of gain total, and the 100 miler will have 600 feet of gain total. Featured in this image is one clear winner and a bunch of losers. If you don't want the Grinch to steal Christmas, dress better than him. Or I'll tell Santa to put coal in your stocking. We will award the TOP 3 Costumes a 100% comped entry into any future solo race on the schedule. The park gate will be OPEN all night. You may pay the park entrance fee on your way out of the park ($7 per person, ages 12 and under free). The final cutoff for the event is Sunday 12:00 pm at the Elm Lake Pavillion for ALL distances. If you are on the course after 12:01 you will not be counted as a finisher and will be picked up via the gator driver. You can have a drop bag at all of the aid stations for the 50 mile and 100 mile distances. There will be drop bag locations marked at the Elm Lake Pavilion starting Friday night. We will take them out to the course at 5:30am Saturday morning. We will return the drop bags around 1:30 pm Sunday as we break down the aid stations. 50 miler pacers may have a pacer for loop 3, and 100 milers may have a pacer for loops 4, 5 and 6. You may only have one pacer at a time. 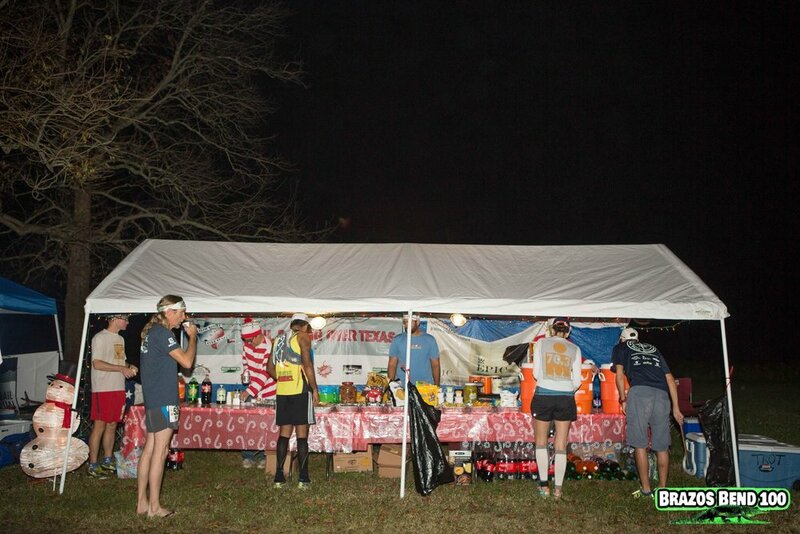 Crew is allowed at any aid station. All of them you will need to walk to our mountain bike to. You may access the sawmill aid station via car which you will need to head out of the park go north and head east on sawmill road 3 miles. The aid station will be at the end on the right but there is no official parking so you will have to be on the side of the old road. There is a $7 fee per person for entering in the park. Children 12 and under are free. We will have a cargo van that will run from the Nature Center to the Start/Finish area. For the most part people walk, but if you have heavy stuff or your legs are hurting we will be more than happy to run you around. There will be a SHUTTLE sign on the van. THERE IS NO CAMPING AT THE START/FINISH LINE FRIDAY NIGHT but you can setup canopy tents etc. We DO have the DINING HALL rented out so you can primitive camp there since usually all camping has already been taken. If you DO NOT have an RV or Camping Site you CANNOT bring in anything more than a personal vehicle. So you CANNOT bring in an RV, trailer, pull along etc. So book or site or bring something else. 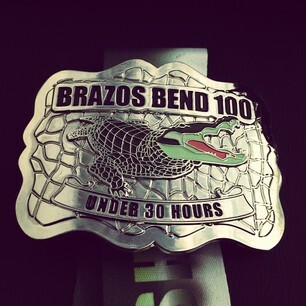 To win the new Texas Two Step Buckle you must complete the 100k in April and the 100 miler in Brazos Bend. 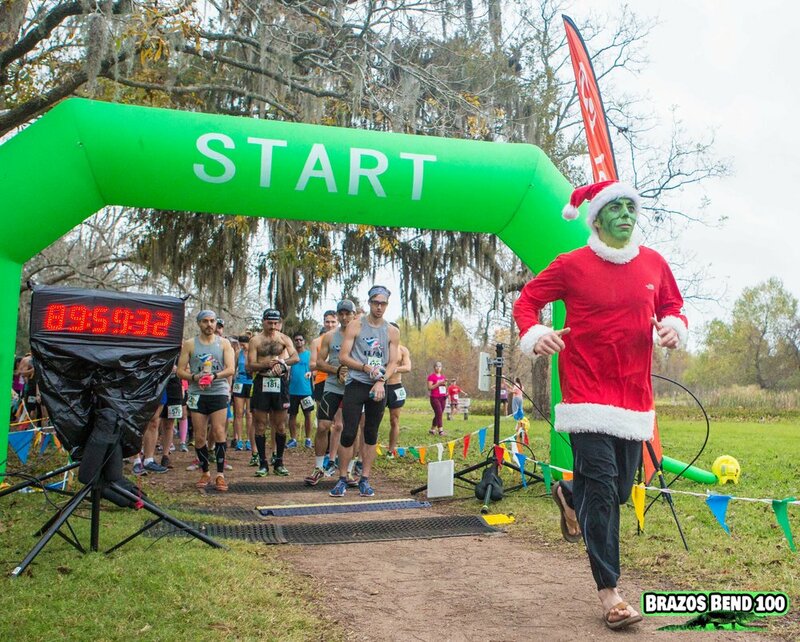 To win the infamous boot mug you have to complete the Brazos bend 50 miler and the Brazos Bend 100 miler in the same calendar year! The 50 miler is in April and the 100 Miler in December. $2000 to the first male or female who resets the fastest 100 mile time on 100% TRAIL in North America. Volunteers have been a vital part of Brazos Bend State Park since its opening in 1984. The volunteers organized in 1989, by electing officers and accepting by-laws. We operate as an independent, nonprofit 501(c)(3) organization. The Brazos Bend volunteers have been recognized for the highest number of volunteer hours, 15,821, for any park in Texas. 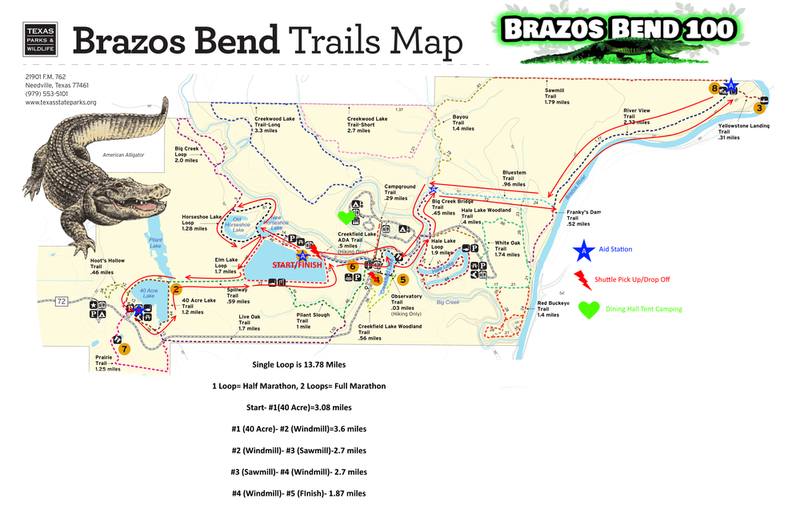 The volunteers have demonstrated teamwork and quality of hours in support of Brazos Bend State Park.